The Laureate RTD temperature transmitter provides a linearized, highly accurate, stable and repeatable transmitter output for 100 ohm platinum, 10 ohm copper and 120 ohm nickel RTDs. Pt100 platinum RTDs can have a DIN alpha of 0.00385 or ANSI alpha of 0.00392. The RTD type and temperature range, specified in °C or °F, are user-selectable. The temperature range can be as wide as the entire span of the RTD type or as narrow as 150 counts (such as 15.0°), limited only by considerations of electrical noise and digital filtering time constants. Digital calibration of all RTD ranges is performed the factory, with calibration data stored in EEPROM on the signal conditioner board. This allows signal conditioner boards and ranges to be changed in the field with no need for recalibration. Typical accuracy for a Pt100 is better than ±0.04°C (±0.07°F) ±0.01% of reading. Open sensor indication is standard and may be set up to indicate either upscale or downscale. RTD excitation is provided by the transmitter. RTD connections can be of the 2-, 3- or 4-wire type. With 3- and 4-wire connections, the transmitter automatically compensates for changes in lead resistance to the sensor. Instrument Setup Software allows user calibration for RTDs whose resistance is different than nominal at 0°C. 4-20 mA, 0-20 mA, 0-10V or -10V to +10V analog transmitter output, isolated, jumper-selectable and user scalable. All selections provide 16-bit (0.0015%) resolution of output span and 0.02% output accuracy of a reading from -99,999 to +99,999 counts that is also transmitted digitally. Output isolation from signal and power grounds eliminates potential ground loops. Dual solid state relays, isolated. Available for local alarm or control. 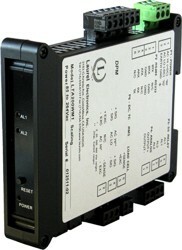 Rated 120 mA at 140 Vac or 180 Vdc. Multiple setpoint operating modes are individually selectable for each relay, as explained in the dual-setpoint controller page. Relay duty cycles and chatter can be minimized with programmable hysteresis and time delays. A band deviation operating mode can be selected for each relay, where an alarm is generated whenever the reading is a selected number of counts above or below the setpoint. The relay modes have to be non-latching, since 4-20 mA temperature transmitters do not offer external reset.